Having a stove or oven/stove combination in your kitchen can be an essential part of the home. Stoves allow you to cook food, boil water, or heat items. Stoves come in a variety of configurations from glass cooktops only to elaborate stove/oven combos, but most are powered in one of two ways, through electricity or gas. While most homes that have natural gas may include a line to the kitchen, it is possible to have an electric stove with any energy source. In many cases, a gas line can be run to homes without an existing one. Both types of stove provide the means to cook food, but there are differences in the way they operate and are installed. We outline the differences between the two below so that you can make a more informed decision about which one is right for your home. Both gas and electric stoves come in a range of styles and appearances. Most standard stoves are available in black, white, stainless steel, and a few other select finishes, regardless of the energy source. In these cases, the biggest difference in appearance is the top. Electric stoves use coils, which are either visible or under glass for a sleeker appearance. Gas stoves have raised, visible burners and rings as well as grates to set the pots on. Many manufacturers offer models of both gas and electric stoves that have similar features, especially for mid-range products in traditional and contemporary styles. Some very high-end models are available in gas only and may have additional features, such as bold colors or warming drawers that are not available in electric. Other manufacturers have high-end electric models, which include grills and fans that are not available in gas. Gas stoves are designed to ignite and produce heat immediately, which means they begin to cook food quickly. When shut off, the heat immediately ceases, and the burner begins to cool, which allows you to leave pots on the range without worry of overcooking. However, running fans or a strong gust of wind from an open window has the potential to put out the flame on a gas range during cooking, so take precautions to avoid this. Electric stoves heat up more slowly, sometimes taking a few minutes to reach their desired temperature. This may mean a small delay in how quickly your food cooks. When the burner is shut off, the element remains hot for several minutes. It may appear like the other burners, which can lead to confusion and overcooking if a pan is placed or left on the burner. Electric provides very steady heat at any setting. This means that it can produce consistent low heat without the risk of going out like gas. So, for keeping food warm or simmering for long times, electric stoves perform better. In addition, electric stoves offer the option of having induction as a cooking method. Induction cooking has many advantages, such as heating food more evenly, fewer problems with scorched pans, and using less energy. Gas stoves, however, work better at high temperatures and have the additional benefit of an open flame. This allows you to char, toast, and flambé, which gives you more flexibility. For everyday cooking, however, both perform similarly and should give you the ability to cook a meal with only minor adjustments for timing between the two. Installation for an electric stove is fairly simple. The appliance is carried in, hardwired or plugged in, then moved into position in the counter. This takes less than an hour from start to finish and, in some cases, may be a DIY project. Gas stoves are more difficult to install, particularly if you do not already have a gas line run to the house or kitchen. In the case of installation, a gas line will be tapped either off the main line and brought to your home into your kitchen or tapped off the main line already entering your home and then into the kitchen. The line will be hooked up to the stove, and the stove will be plugged in or hardwired for the electric ignition and clock/timer features. Then, the appliance can be moved into place. This can take several hours to days depending on the existence of the gas line. In addition to the added time, adding a gas line to your home can greatly increase the cost of the project. Electric and gas stoves have similar costs for purchase of the stove itself. A 5.3 cubic foot, single-oven electric stove costs around $500 on average. A 5.3 cubic foot, single-oven gas stove costs around $600 on average. Both can range from $400 to $3,000 depending on size, number of ovens, and options chosen. For installation, however, this cost depends on the gas line. An electric stove costs around $160 for the installation and minor modifications for fit. A gas stove will cost similarly if the line is already in place. However, if there is no gas line, then the installation cost of a gas stove climbs to between $360 and $660 depending on how far the line needs to travel. This makes the average cost of an electric stove between $660 and $700 on average, while the cost of a gas stove can range between $760 and $1,260 depending on the need for a gas line. Gas stoves use either gas or, in some cases, liquid propane 1 as fuel. If you have a gas line near your home, it is possible to run the line to your home to power your stove even if you do not have gas heat. 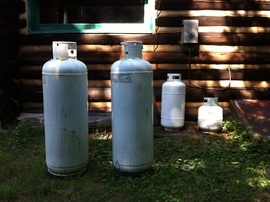 Propane may be used in some gas stove models for homes without a gas line but use liquid propane for heat. Electric stoves run only on electricity. They can be used in homes that have gas, liquid propane, or other heat sources, as well as homes that primarily use electricity. Both natural gas and liquid propane 1 are considered clean-burning and relatively inexpensive fuels. The key, however, in determining energy costs is to look at a broader picture. If you currently have a gas line installed, then a gas range will cost less. Not having a gas line means a nominal fee per month just for the hookup, the gas you use, and the expense of running the line. Pilot light gas stoves cost more to run than electric ignition gas stoves. Gas pilot light models are more expensive to run than an electric stove, while an electric ignition gas stove costs the least of any model. For electric stoves, an induction model costs the least of the various types, while a standard model costs the most. Energy costs vary by state but expect to pay anywhere from $20 to $60 a year for a gas stove and $30 to $45 a year for an electric stove. Electric stovetops come in a few styles. Glass-topped models are fairly easy to wipe clean, but if a sugar-based sauce boils over, they can take some serious scrubbing to get the glass clean again. Coils that lift up and allow you to remove the component underneath to clean and replace also make electric stoves fairly easy to maintain. Gas ranges can be slightly more difficult to keep clean. While you can lift the grate away to wipe around the element, the element itself can be harder to clean. Gas stoves are not as flat as electric stoves, which means that they do not offer as much additional counter or storage space when not in use. During a power outage, a pilot-lit gas stove can still function because they only need a match to ignite. Newer models, however, rely on electricity to ignite and, therefore, will not work safely in an outage. Electric stoves do not work in an outage and need a backup supply of energy from a generator to function until electricity is restored. When it comes to durability, gas ranges tend to last a few years longer than electric. Electric elements wear out faster than gas ignition parts, which accounts for some of the difference. In addition, ceramic or glass-topped ranges can shatter if a heavy object is dropped on it or if very cold water is splashed on a hot burner. They can also become permanently scratched and stained easily, either through dragging items across it or allowing sugar-based items to boil over. Gas ranges have an easier-to-maintain surface that will not shatter or scratch, so they require less maintenance and fewer repairs. Any gas appliance in the home has the potential to develop a gas leak, which can cause fires or explosions. In addition, gas ranges may allow gas to enter the room without igniting, which can cause a hazardous buildup of gas. This may also happen if the flame goes out during cooking, and it is not noticed. Electric ranges are safer in that regard, but they still pose some safety risks. The burner may appear cool to the touch, while in actuality it is still red hot. This can lead to burns. While most models have a light that indicates if the burner is still hot enough to burn, small children or pets may touch the burner before it is cool. Both electric and gas ranges are available with a selection of options, but electric models may have more to choose from. Electric stoves may include grills, fans, warming drawers, and lights while gas models may have only warming drawers. Electric also has the option for using induction and conduction to cook your food. Neither gas nor electric stoves have an edge when it comes to resale value. In either case, choosing a high-quality stove that fits the style of the kitchen and offers at least a few cooking options is the better choice for resale regardless of how it is fueled.